What did it really take to make Vanilla WoW? The game's first 3D level designer reveals the ugly, crazy world of making games. 8,379 backers pledged $598,999 to help bring this project to life. My name is John Staats, and I began writing The WoW Diary on March 17, 2001. I remember it was near midnight on a Saturday, during Blizzard’s 10th Anniversary Party. Instead of attending the company festivities, I was in my office, pensively thinking about dungeons because that's what the company's first 3D level designer does when dungeons aren't working. After six months, there was scant evidence that the game was going to work, certainly not under the budget or schedule we'd been given. WoW was my first experience with an unfinished game...and I couldn't believe that making one from scratch was this hard. I'd spent my first 6 months working over 90-hour weeks using the Quake 3 editor to build levels. I enjoyed the work, but the absence of progress was disturbing. There were many show-stopping issues with dungeons, and my only contribution to the project was to show that FPS technology, processes, and tools were incompatible with MMOs. After six long months, no one else on the team knew what to do either. We couldn’t find experienced 3D level designers (willing to work for what the project could afford). Every week I send the company recruiter half a dozen "candidates" whose work I found on the internet--though none were interested. Nor had any suitable environmental texture artists applied for positions on our jobs page (and none of the staff artists wanted to work on dungeons). I wasn't even satisfied with what I was designing. I had to launch Quake 3 just to walk through my structures--and everything looked dark and edgy, just wrong for Warcraft. I began to worry, “Would we have to make our MMO without dungeons?" That Saturday night, I put fingertips to keyboard and began my four-year chronicle about the games industry, Blizzard, Team 2, and WoW. Whether the project was a failure, or by some miracle, a success, I was convinced it was going to be a good story. Computer game development is not pretty. My book, The World of Warcraft Diary, offers a rare, unfiltered, comprehensive look at game development. I start at WoW’s humble beginnings, and give a fly-on-the-wall access to the dev team’s conversations, debates, failed experiments, and internal pressures. Licensed by Blizzard Entertainment, it contains over 130 behind-the-scenes images (many of which have never been seen before). Every image is captioned and dated within the project's timeline. Although the book has been licensed by Blizzard, I didn’t write it like the average promotional merchandise, or the typical art folio brimming with gorgeous concept sketches. In fact, I kept the pretty pictures out of the book. I am celebrating the chaotic, humorous, and ugly side of computer game development. I covered the people and philosophies behind the curtain. If you’ve ever wanted to know the ingredients inside Blizzard’s secret sauce, this book is for you. Who is the author (John Staats)? I served on World of Warcraft for over 10 years. On the original product, I worked longer hours than anyone on the team. My ears were so low to the ground, my officemates and I played a game where they'd try to surprise me with recently heard gossip—and I took great delight informing them that I’d heard it weeks before. When I left the WoW team, I had logged more bug-fixes than anyone else in the company (Mike Morhaime joked that I’d probably caused more bugs). After I joined Blizzard, so many of my misconceptions about the games industry were dispelled that I thought a development diary would be a compelling subject to cover. Most companies give only a short, vague idea how games are made. I wanted to give an on-the-ground report about the devs. I wrote about our teams’ complaints, moods, arguments, and inside jokes. A few years ago, I developed a medical condition with my hands that prevents me from sustained computer use—including both making and playing computer games. With computer game development in my rear-view mirror, I am passing on what I learned about the industry. What production values can be expected? Before joining Blizzard, I had been in advertising for ten years, so I’ve lots of experience with printing. I’ve weathered angry glares from pressmen twice my age for holding back print runs for minor color corrections and errors. I will be on-press for this book to personally sign-off on every sheet and can guarantee that this will be a high-quality item. The WoW Diary will be fancier than most books. For you printing nerds, it’ll be printed in the United States, on a brand-new press, a Heidelberg Speedmaster XL 106. This press uses a sheet-fed process which gives superior control over ink coverage—at double the cost of a web press (which is how most books are printed). It will be full-color, full-bleed (and varnished if necessary), and, of course, it made using a high-quality matt-coated paper stock. I will be on-press for weeks to sign off on every sheet. I expect The WoW Diary will become your go-to coffee table book. Electronic backers will receive a PDF and an eBook version of The WoW Diary after this campaign is funded (3-6 weeks after the Kickstarter closes). The PDF/eBook will have the same images and words, although The WoW Diary layouts/captions are best viewed through a full-spread format. First Edition Backers will receive an Electronic Edition + a printed first edition of The WoW Diary, comparable to a 8” x 10” hardbound textbook with 336 full-color pages. It has over 95,000 words (the length of The Hobbit) and over 130 captioned images. Showcase Edition Backers get an Electronic Edition + a signed first edition of The WoW Diary encased in an sleeve (book case). Included inside the sleeve will also be a saddle stitch-bound booklet, containing four essays about the team after WoW shipped. I omitted them from the book because they fell outside the timeline (the book ends after I cover the game’s launch). While these essays will be available online, they make for worthy companion pieces. Press Sheet Edition - GONE! - backers will receive a Showcase Edition of The WoW Diary and one signed press sheet--used to approve the printing of the first edition of The WoW Diary. Each sheet will have my sign-off indicating the page is a "go" on the print run. There are 21 unique press sheets, roughly 22 x 36 inches in size, and there are 8 pages on each side of the sheet. I have no control over the imposition (arrangement of pages), but the odds are high (with over 130 images) that either side of the press sheet will have images. For a book that celebrates the production process, these complement the Kickstarter. It looks like the book is already finished, what will the money be used for? Where I can get more information about The WoW Diary and John Staats? 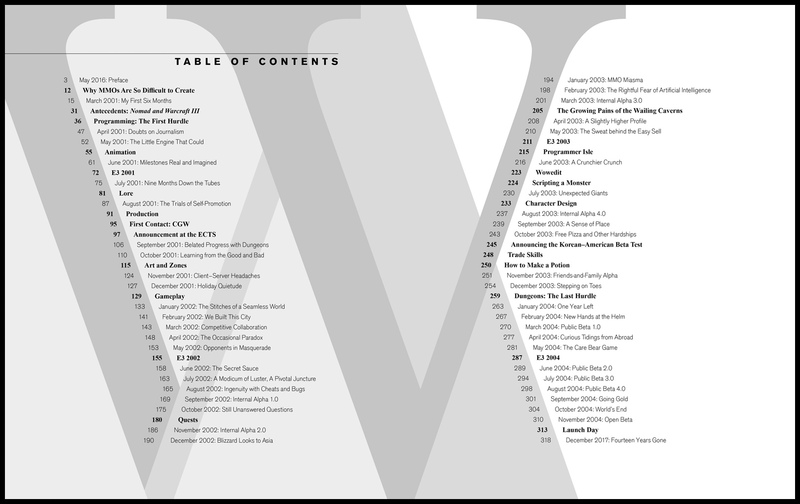 whenitsready.com has some juicy excerpts and covers my post-Kickstarter goings on. Updates on The WoW Diary will be made via Twitter @JohnStaats_WIR. If you don't want spam about my book’s progress, but you do want previews of my next project (a dungeon-based board game), sign-up to my email list. This stretch goal will fund two versions of The WoW Diary. The first, will be the standard Amazon Edition that has all the high-end specs already listed. Then, I'll print a Golden Edition that will be for only and all of my Kickstarter First Edition backers. Upgrade 1: $300,000 - Funded! The end sheet (pictured below) will be gold that reads “Original Kickstarter Backer" followed the whenitsready logo. The mock-up (on the right) shows the subtle printing, and the magnification (on the left) is darkened and enlarged for readability. Upgrade 2: $350,000 - Funded! Gold foil title lettering on spine and front cover differentiates Kickstarter editions from non-KS prints. Upgrade 3: $400,000 - Funded! Spot varnishing makes all the pictures shiny and opens opportunity for shiny "ghost shapes" on an otherwise blank page. Very few books have this because it costs a lot, but if we hit this mark, I'll add it for free. This means all hardcover Kickstarter backers will have a rarer copy (only a few thousand worldwide) than later editions. The Gold Kickstarter Edition will never be reprinted. Owning one means you've helped found my new company, whenitsready and its flagship product, The WoW Diary. By reaching the Golden Stretch Goal, The WoW Diary would have become, at least, the 3rd highest funded non-fiction book in Kickstarter's history. The only way to make this happen is to tell your friends. Tweet and Share this link to let everyone know you support The WoW Diary. Let your freak flag fly and distinguish your copy from future printings. Read below for achievement details. The reward for this achievement is a special bookmark, of which I am not showing. The bookmark design isn’t a “secret” because I’m not finished with it yet, it’s design has been done for over a year and I want it to be a surprise when you receive your hardback edition of The WoW Diary. It has two Easter eggs, one of which refers to something in the book, the other won’t be apparent until I release my next project, a dungeon-based board game. The Golden Kickstarter version of this bookmark will never be reprinted again (extras will be destroyed at the printer). By reaching 300 achievement points all Kickstarter backers will receive a golden (Kickstarter) bookmark with each hardcover. I have a licensing agreement with Blizzard Entertainment to use their content for this book. I've had lunches with their management about the book and I sent them over a dozen copies to read, fact check, add details, and make corrections. Even their attorneys read it to ensure all was groovy. Not a big reader? You can still support my campaign that pulls back the curtain of computer game development. Backers will receive updates of this campaign's milestones and my next project: A dungeon/bossfight board game unlike anything you've seen before. Electronic Edition backers will receive The WoW Diary in both PDF and eBook standard DRM-free EPUB formats. Electronic Editions will be made available after this campaign is funded (3-6 weeks after the Kickstarter closes). Be aware that eBook captions and body text cannot be independently sized. While the eBook version of The WoW Diary has the same images and text of the printed version, some layouts won't work (where the text and images are meant to be viewed together). Backers will receive Electronic Editions of The WoW Diary (when funded) + a full-color, hardcover, first edition of The WoW Diary by mail. These copies will be 20% less than the Amazon price and will be delivered before they're available for sale. A full-color, hardcover, First Edition of The WoW Diary signed by the author in gold paint marker on the half-title page. Each backer will receive a Showcase Edition of The WoW Diary and one signed press sheet--used to approve the printing of the first edition of The WoW Diary. Each sheet will have my sign-off indicating the page is a "go" on the print run. Per my licensing agreement, I will never offer WoW Diary press sheets again. In a book with 336 pages, there are 21 unique press sheets. I'm keeping one to frame (as a poster) and selling the rest. Press sheets are roughly 22 x 36 inches in size, and there are 8 pages on each side of the sheet. I have no control over the imposition (arrangement of pages), but the odds are high (with over 130 images) that either side of the press sheet will have images. For a book that celebrates the production process, these compliment the Kickstarter.